Vertical farming is one solution that’s been implemented around the world. 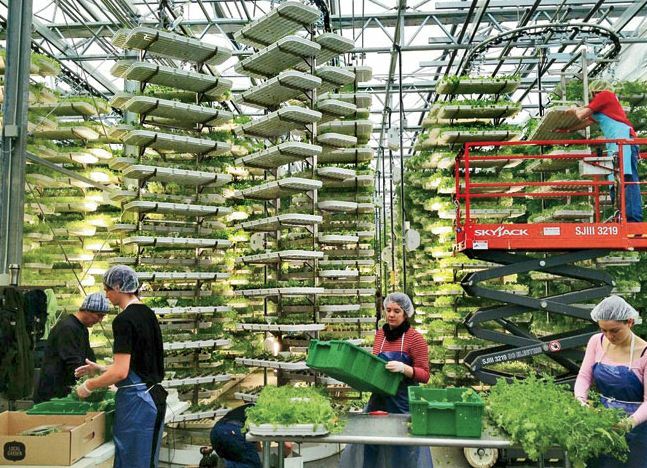 Vertical farms produce crops in stacked layers, often in controlled environments such as those built by AeroFarms in Newark, New Jersey. AeroFarms grows a variety of leafy salad greens using a process called “aeroponics,” which relies on air and mist. AeroFarms’ crops are grown entirely indoors using a reusable cloth medium made from recycled plastics. In the absence of sun exposure, the company uses LED lights that expose plants to only certain types of spectrum. AeroFarms claims it uses 95% less water than a traditional farm thanks to its specially designed root misting system. And it is now building out a new 70,000 square foot facility in a former steel mill. Once completed, it’s expected to grow 2 million pounds of greens per year, making it the largest indoor vertical farm in the world.